Amy Shuman, Western Folklore 2/3 (2009): 384-387. They Called Me Mayer July is one of those rare multi-genre productions that works at multiple levels, as narrative and counter-narrative, tableau, portrait, and memoir, interposing the everyday and the ordinary into life story. 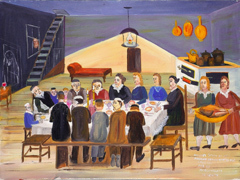 Through paintings and personal narratives, Mayer Kirshenblatt describes his childhood experience of Jewish life in Apt, Poland before World War II. It is a portrait of a community destroyed by the Nazis, but Kirshenblatt's portraits do not focus on destruction. As he says, he painted his portraits, "lest future generations know more about how Jews died than how they lived." The narratives are multiply dialogic, produced in dialogue with Mayer's daughter, Barbara Kirshenblatt-Gimblett (who also wrote an afterword to the book) and in dialogue with the paintings and with both the lived and the destroyed past. Although deeply personal, the personal and the community stories are not separable, and neither works as a simple chronology. The personal story is created out of retrospective reflection that requires the reader to shift positions through the reading. Only in the second half of the book do we learn the reason for Mayer Kirshenblatt's father's absence, his departure to Canada after losing his business inventory in a train wreck, an event that brought Mayer to Canada before the Nazis came. This story, linking Apt and Toronto seemingly inexorably, is suddenly fragile. Mayer Kirshenblatt could as easily have stayed in Apt. These are not just an immigrant's memories. They are the accumulated stories of the displaced or murdered Jewish residents of Apt: in telling them, Mayer Kirshenblatt is both witness and memoirist. Fans on Amazon: 5 stars! Here are the reviews from fans on Amazon. Five fans and all give the book a five star rating. 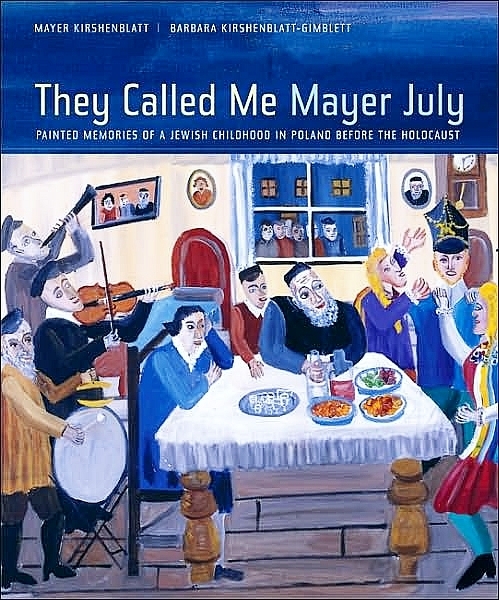 They Called Me Mayer July is a beautiful book, both in the written word and the art work. It details the day-to-day lives of the Jewish people who lived in their 'schtetles' before the Holocaust and it goes into the various personalities, nick names, and jobs that were done during those years. Artistically, the detail is stunning and a joy to behold. For those of us whose ancestors came from these places, it gives us the opportunity to see and read what life was like, both the good and the difficult. I was so impressed that I bought a book as a gift for a friend and have recommended it to others. We owe a debt of gratitude to the author and his daughter for giving us this wonderful gift. Part Marc Chagall, part Bruno Schulz—and even a little Maira Kalman—the artist (a.k.a. Mayer Kirshenblatt, born in 1916) provides a fascinating, humorous, and poignant record of Polish village life, in the years leading up to the Second World War. There are weddings (the marriage of the tailor’s pregnant hunchback daughter) and funerals (the Christian burial of the artist’s boyhood friend). An adulterer is discovered, zealous flagellants offer their backs for caning, and a “human fly” scales a local building. Incredibly, the artist, who emigrated to Canada in 1934, didn’t start painting until the age of seventy-three, and then only at the urging of his wife and daughter. Whether Kirshenblatt’s visual account is accurate or embellished hardly matters; it’s the remarkable results that count. Through Oct. 1. (Open Saturdays through Wednesdays, 11 to 5:45, and Thursdays, 11 to 8.) The New Yorker, June 22, 2009. “Hey! There was a big world out there before the Holocaust,” Mayer Kirshenblatt calls out in his recent book about Jewish life in Poland before World War II. 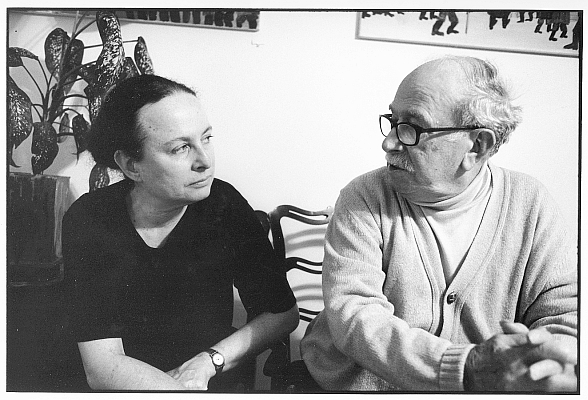 In 1990, when Kirshenblatt was 73, he began to draw to ensure that people would remember how Eastern European Jews once flourished before so many perished. At the urging of his family, he sketched his memories of life in Apt (Opatów in Polish), the small town he grew up in before World War II and eventually left. He painted his mother and the town’s wigmaker, men praying in the besmedresh (study house), and prostitutes in the marketplace. As a child, Kirshenblatt spent his mornings in kheder (Hebrew school) and his afternoons in the town’s Polish public school, but he devoted almost as much time to playing hooky and exploring everyday activity in Apt. 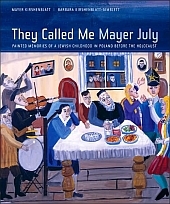 In an exceptional exhibition and ambitious companion book of the same title, They Called Me Mayer July: Painted Memories of a Jewish Childhood in Poland before the Holocaust (University of California Press), we join Kirshenblatt as a young boy. We go on meandering walks with him, taking in the spectacle of the livestock market, eavesdropping on gossiping women, inspecting the components of a shoe and the workings of a whistle.